Just bought my second saw. My first one still works great, I just couldn't pass up this great price. This saw cuts strong and true. The problem of the dual bevel system was fixed in this newer version. I use this saw every day and it works great. A plus. This is the slide compund miter to own! I've been using this saw for years and it works flawlessly and lasts through much use and abuse. I decided to get a new one this year because the price and promotions made it hard to pass up. HOWEVER! The saw arrived without any sign of the free extra blade, or the mail in rebate form for a free drill. when I tried to find a phone number to call to get help from amazon...I could not find one any where on their web site, or on my receipt! I submitted two e-mail help requests and got no response. Amazon has really dropped the ball on customer service! I finally called Tool Crib (AKA AMAZON) and got a customer service number from them 800-201-7575 and am in the process of sorting out the extra blade. For the free drill you'll need to print and mail a form found through various links from the saw page. Good luck! This is an improved model of an already great tool! It was always the smoothest running and cutting saw before! Now it has easier to read markings on both bevel and table angle settings. Possitive angle notches in the table. Dual bevel and the belt drive is sooooo nice! The free blade is one of the best out there for cabinet or trim work. Buy it and you'll be hooked!We have used these Hitachi sliders since 1989 and we can't find anything close to it's quality and performance. I've owned this saw for over 5 years now and will most likely grab another one for the crew. It doesn't get anymore percise than this unit.We work on exclusive homes on a daily basis that are loaded with sizeable moldings.A little clue to those who try and cut everything standing up, LAY IT DOWN. You can be much more accurate with your molding laying on a flat serface,specificaly large crowns and baseboards.So my advise to Bobby from Boulder is to learn how to use that exspensive saw you speak so pourly of or just work with 3" moldings for the rest of your days. As the owner of a trim carpentry business with 5 employees, I have to admit this saw is the most versatile I have found. Each employee has one entrusted to him, and I have tried the other brands and even own the new 10" Hitachi dual-beveling saw. The point that needs to be made is that the description at this time from the manufacturer says that this saw bevels both directions- which it does not. It miters both directions, but only bevels to the left. The larger ten inch Hitachi bevels both ways, and it a nice saw to own also. The beauty of this saw, though, it that it lasts practically forever, is lightweight, and versatile. We cut up to 24" shelving by cutting one direction, then flipping it over and finishing the cut. We cut miles of crown flat with it using compound mitre and bevel cuts, and it's not a big deal to flip your piece around. (Most of the time, we use a crown that you can flip over and cut due a flat profile instead of handling the long length again) Buy this saw, you will enjoy it. 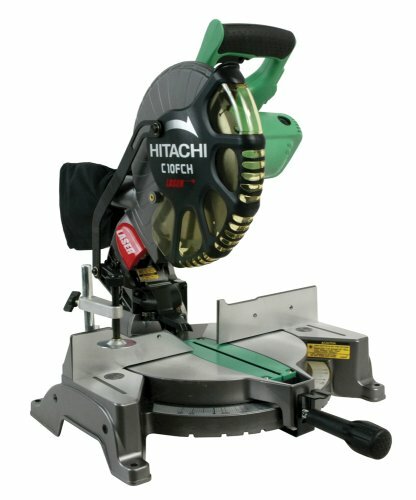 Hitachi has come soo close to perfection with this saw. 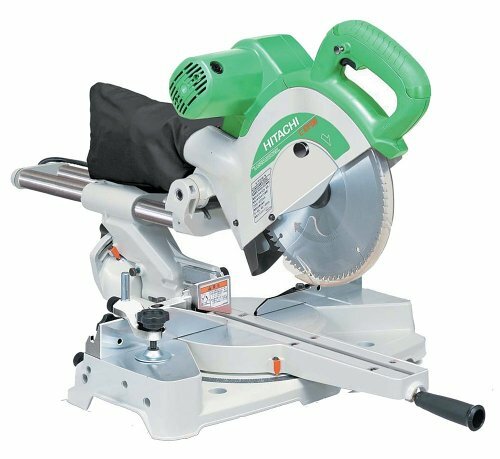 It's small blade, high power motor, and well designed slide mechanism make this saw cut more consistently high quality cuts than any other saw on the market! But, this saw also has some serious weaknesses. 1) Only tilts in one direction. 2) Fence is too short( all cuts must be done flat.) 3. Fence is too soft. becomes bent after relatively short period of constant use. plastic fence pieces break and are tooo flexible. can be remedied by attaching hardwood to fence but this limits the clamp. 4) smaller capacity. while I say this is the best on the market I have not tried the latest 10" sliders to enter the market. PLEASE NOTE THAT EVEN WITH THESE DRAWBACKS IF YOU MUST HAVE A SAW TO DO FINISH WORK THIS IS IT. THIS SAW MAKES THE DeWalt SEEM LIKE A TOY! No other nail gun is even close! I am a roofing contractor. 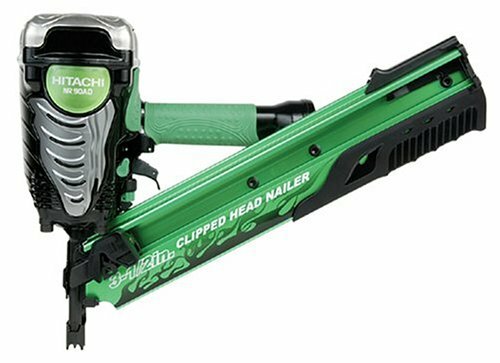 I have tried a few other brands of nail guns but none can come close to the quality and durability of the Hitatchi! There is nothing else to say. You can not beat this gun. It won't dissapoint you! 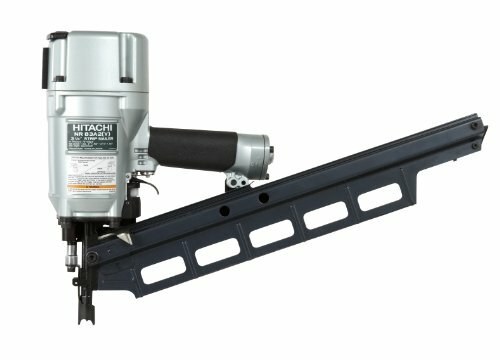 I researched several roofing nailers and based my decision on the reviews I read about the Hitachi. I have shingled two roofs so far and have had zero problems. The second roof I did was for a friend and he helped with his Poter Cable nailer. It was picky about the nails that were used, jamed often and had no depth setting. The Hitachi kept plugging along and never missed a beat. The depth setting was crucial for the different situations when installing shingles. After years of hammering nails and seeing other guns in action, I highly recommend the Hitachi NV45AB2. 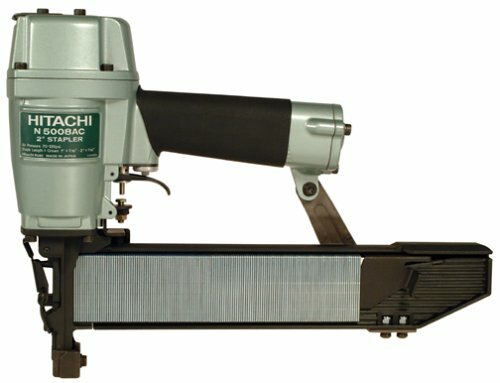 Hitachi has long had the best roofing coil nailer on the market with the NV-45AB. This new and improved model actually made the best thing even better. 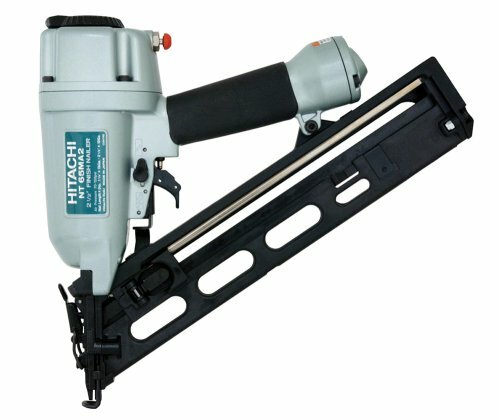 It is very similar to the previous nailer but it offers an easier method to reload coils. Much more durable than any of its competition. I have tried them all. Max, Bostitch, Senco, Paslode. Nothing can surpass the Hitachi! Lightweight at only 4.2 lbs. I've used this gun quite a bit and it hasn't misfired yet. It's simple to use and feels solid, made to last. Plenty of power too; sinks 2 1/2" nails into pressure treated fir with no problem. In white pine I had to back the pressure off to keep it from sinking them TOO deep! The air nozzle feature should be on every finish nailer. You'd be surprised how handy it is; no need to put the gun down to clear away the chips etc... that always seem to get in the way of a good fit. The only drawback I found is that you'll have to go to a good hardware store to find an air fitting for it. Once that's done it's the perfect finish nailer. excellent tool--but no free shipping as advertised--but bought the tool anyway! don't know if this is indicative of amazon policy--used car salesmen! 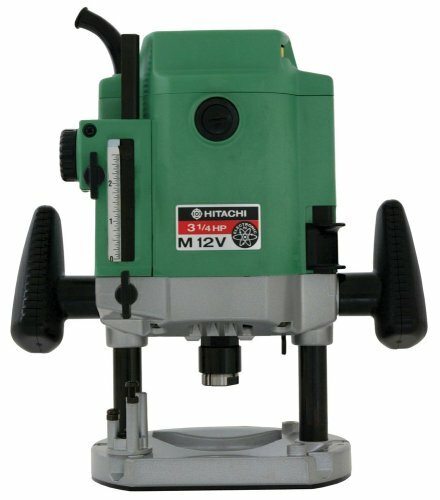 When it comes to designing nailers, Hitachi keeps the end user in mind. 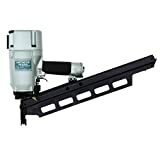 Their siding coil nailer, engineered for serious siding work, impressed us with its light weight (only 4.6 pounds), which does wonders for your arm (not to mention your productivity) toward the end of a long day. We're also suckers for a good grip, and the NV65AH has a great one--it's rubberized, and, unlike a lot of other tools we've known, it's also a width that normal-size humans can get their hands around. This nailer's got an easy-to-operate depth-of-drive adjustment as well, to countersink or flush-drive nails, and a smooth firing mechanism. The air deflector pivots 360 degrees--a nice, user-friendly feature. This nailer is like a german sports car. It's got power, performance and handles like a dream. 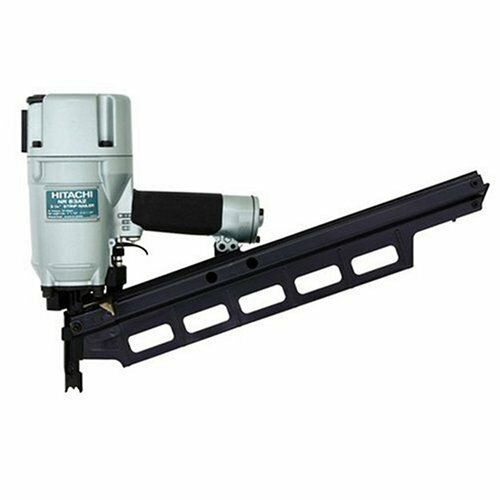 The single most important feature for a good siding nailer is the ability to accurately dial in the depth that the nails are driven. For cedar, or cement board siding the depth of drive is crucial. This nailer lets you adjust the depth of drive with absolute accuracy. You can flush nail all day long and you almost never have to pull your hammer out to set a proud nail. In addition, this nailer is light at 4.6 pounds which is also important when your using it all day on a ladder or scaffolding. The other feature that I love is that the nailer is extremely well balanced for a coil nailer. Most coil nailers are nose heavy because they don't have the stick housing to counter balance them. 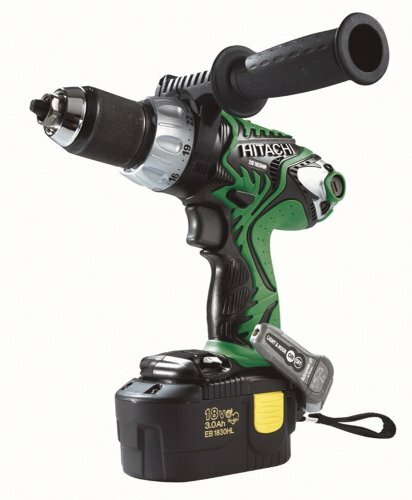 This nailer is not nose heavy and just has a great feel in your hand. Of all my tools, this is one of my favorites. I have not had a single jam and I've fired thousands and thousands of nails with it. This is a high performance tool, and I would highly recommend it to anyone who has any amount of siding to put up. It's a time saver, and truly a joy to use. I shot one box of 4800 2 1/4" ring shank galvanized nail through this gun the first time I used it. Oiled it often and kept clean as possible. There was the occasional miss where the nail had fallen out of the coil but it was harmless. Depth gauge worked well and was easy to adjust. This gun is lightweight, the Senco is a beast. I had started hanging cedar shingle by hand,but it was way too slow and I was wasting alot of shingles due to breakage. 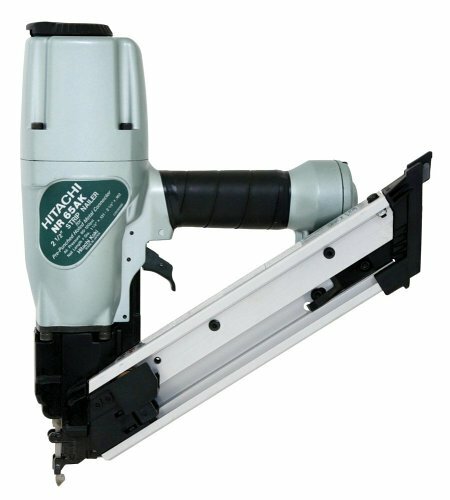 I purchased this nailer and it proved to be a time and labor saver. I needs to be kept oiled or it will jam but very easy to unjam. Do not think twice just buy it. Now I have a fence to build, lucky me I already have mine. This is the best coil nailer I have ever used! I have run a siding crew for over 5 years and have tried them all proformance wise this gun rates #1 in my eyes. Amazon's Tool Crib shipped on time with no glitches. 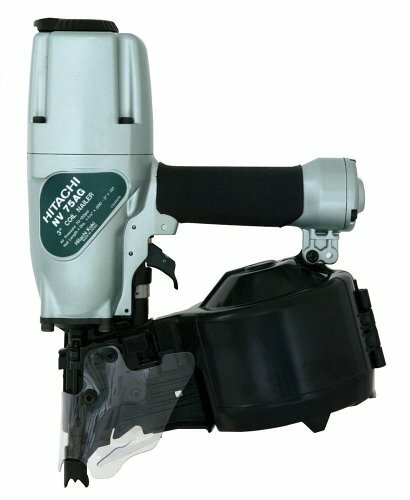 The 75 nailer is typical of Hitachi's great nailers, and has the versatility to do framing and siding. Mine has gone through about 4000 2" Senco and 3" Bostich nails for fence building without a miss and little sign of wear. Since I only use it once in a while, I'm confident it will last me a lifetime. Once again, Hitachi produces a superior product. I was in need of another siding gun, and saw the NV75AG just hit the market. Being that I own the siding (4 years use) and framing (8 years use) versions Hitachi makes (both superior products), when it came time to get a second nailer for siding the choice was clear. For several years I have been contempating getting a coil framer. When sheeting walls on the ground I loose considerable time reloading with the stick framer. This gun holds over 225 nails in one coil! And should my stick framer blow a top seal, or sider fail, the NV75AG will allow me to continue. The gun functions flawlessly, with both the depth adjustment on the gun and a non maring tip included. Hitachi includes all allen wrenches and fittings, something other makers should but don't. 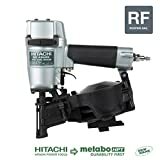 Since I posted my initial review, Amazon has lowered its price on the Hitachi Work Station from $239.99 to $199.99. For someone like me, (who can get by without the extension stop and wheels that come with the TracRac T3) the Hitachi stand is now the hands-down best value of ALL the available stands!! I should also note that although you do not get the 3 foot extension stop with the Hitachi stand there is a flip-away work stop included on the work support arm. Amazon has agreed to credit me the difference in cost. I continue to be impressed with my dealings with this company. TracRac T3 ¿ A BETTER VALUE?? 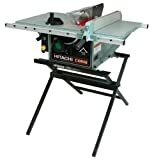 After purchasing the Hitachi C10FSB Miter Saw, I began shopping for a stand worthy of the saw. When I checked back at Amazon, I was glad to discover that Hitachi now has its very own stand. After purchasing other so-called UNIVERSAL products, only to be disappointed - I decided to play it safe and buy the OFFICIAL HITACHI AUTHORIZED version. After reading other customer reviews of the TracRac T3, it became evident that TracRac was manufacturing this product for Hitachi - Great! I thought - especially since the Hitachi version is ten dollars less. (note: Amazon had not yet posted a picture of the Hitachi stand when I made my purchase). Even after reading the very positive reviews for the TracRac T3, I was blown away by the quality of the components I pulled from the box. This is a very well designed and manufactured product. Hitachi/TracRac must have been listening to James S. McCulley from Albany (who has a review under TracRac called "Great Product - small flaw" about the Hitachi Universal Workstation in which he mentions a problem with the brittle plastic end caps) because included with a note about product improvement are four little rubber shock absorbing pads which you are instructed to insert before applying the end caps - it also looks as though they changed the end cap material to a softer more flexible type of plastic. Good points: Powerful, nice compromise in size and weight for a portable, big table. Great Fence. Sturdy stand. Unbelieveable price. Hitachi needs to tighten up the quality at that Taiwan plant and they will have a winner. I bought this saw on EBAY for $200.00....refurbished with a 1 year warranty. 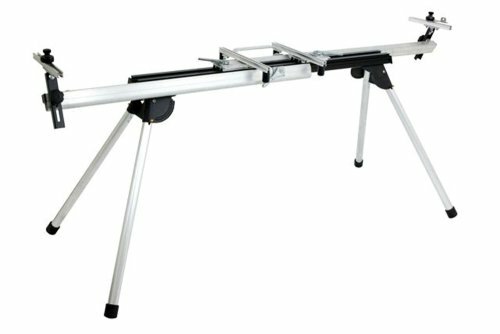 WHAT A GREAT DEAL...Features I liked, High quality fence, Large safty switch, Heavy duty stand, Heavy duty motor, Large table, Portable, Metal housing not cheap plastic...Unlike some of the other reviews I had no problem with the tilt lock handle and the miter gauge..they both work fine. If your looking for a high quality saw but you don't want to part with $500.00...THIS IS THE SAW FOR YOU. 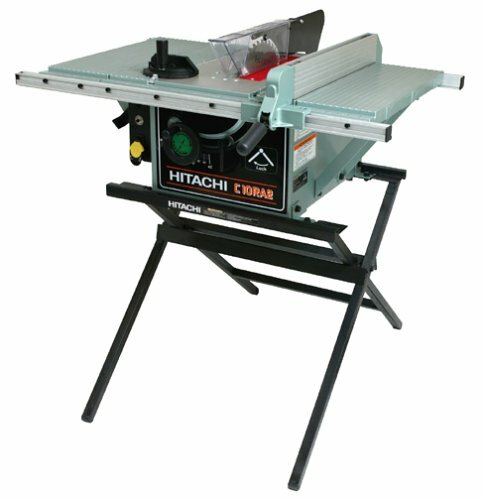 Hitachi has released some pretty decent products in the past, but in my opinion this table saw is definitely not one of them. It does have a few good points like a nice cast iron 3 piece table, and aluminum fence, and the body is sheet metal, and is not plastic, and the motor is plenty powerful. Now for the complaints. The stand that comes with the saw looks nice but functions poorly. Sometimes when I saw a large piece of wood the entire thing slides on the floor, sometimes damaging the workpiece. Another problem I have with it is that there is no way to upgrade the size of the table, in fact there is only one upgrade to the entire unit, a dado insert. The miter slot isn't standard, so you can add absolutely no third party accessories that would fit in a standard miter slot. Concerning the 3 piece table, I have noticed that the two side pieces are sometimes nearly a 16th" off from the center piece and I have to unscrew them and realign them flat, I am afraid one day I will wear out the screws and it won't realign correctly. Yet another problem is with the blade guard. Great idea, but it just doesn't work. When I align the fence and run a board through, the board almost always gets stuck on the blade guard and I have to push very hard (not safe at all), then the stand (with no rubber feet) begins to slip and the whole table saw slides, making it extremely dangerous. I have since then installed the saw onto one of the Ridgid mobile utility carts, and turned the Hitachi stand into a chair(I haven't slid out yet, heh heh). I also removed the blade guard completely. Oh yeah, yet another complaint, This thing is EXTREMELY LOUD!!! Wear ear protection especially at the start up. Oh yeah I forgot about yet another problem. When you use the blade tilt mechanism and want to go to 45 degrees, the blade lock gets in the way and you end up busting your knuckles, and having to realign the lock so that you can move the tilt mechanism and lock the blade so it stays at the angle you want. I have owned this saw for 9 months, and made a couple hundred cuts with it, and in conclusion I definitely wish I had bought another saw, probably a Ridgid. It always happens to me when I try to save a few bucks. 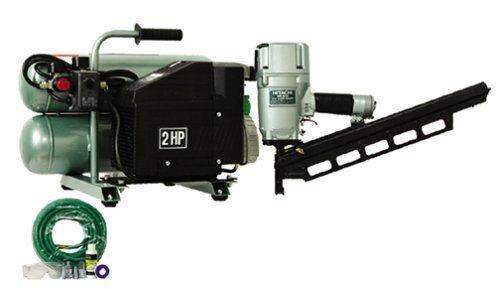 If you are looking for a saw to do just a few cuts maybe buy a less expensive delta, but if you are looking for a semi-professional saw, you may want to overlook the Hitachi C10RA2. I did read the other reviews on the poor quality of the mitre guage on this saw before purchasing, but didn't really think it would be a problem. I got the saw this summer and have put quite a few hours on it since. Overall I like the quality of the saw but I am VERY diasppointed in the mitre guage and slot. Having a non-standard slot is a major problem. It really limits (make that prevents) your ability to use aftermarket products, and the poor quality of the one you get with the saw makes accurate cuts hit or miss. I can't imagine why Hitachi designed it this way. Usually a tool maker does that when they want to make sure you buy their aftermarket parts, but in this case even Hitachi doesn't offer any thing better. The other minor annoyance I have is how difficult it is to adjust the saw for angled cuts. Maybe I'm doing something wrong but the wheel and lever interfere with each other; making it difficult to set and lock down on the angle you're shooting for. I'll keep this for rough carpentry work but I'll have to replace it soon with a real quality cabinet saw. width, so you can't fit any aftermarket attachments to it. move the blade. And yes, it is LOUD! I had one major assembly headache when I unpacked it. One of the bolts that attach the rubber feet to the base was mismatched to the threads of the hole, so I had to make a trip to the hardware store and find a replacement bolt. I have owned this saw for almost 15 years without incident although I have encountered the brake problem noted by solraiz7. I routinely cut 5 1/2" crown using the supplied vise to maintain the cutting relationship with the supplied fence. Unlike the newer and more popular sliding compound saws, you just set it on 45 degrees and cut to length for a perfect joint (outside corner or coped inside corner). I have mine mounted on a Rousseau mobile cart with folding supports which makes it very versatile. As for blades, I have been happy with the Freud 108 tooth blade. A little expensive to buy or sharpen, it gives long life and a clean cut. If you are cutting a lot of pressure treated wood, you probably want something in 10 in size with a ready supply of throw-away blades. 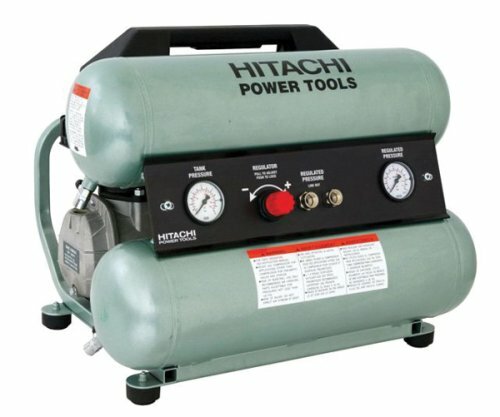 I have been using several of the Hitachi 15in. saws for many years. There is no substitute for cutting tall baseboard and crown. The only drawback is that the blade brake on my saws has worn after years of use and rarely kicks in without some coaxing. I have to flip the switch several times to get it to kick in. Changing the brushes has helped but the large blade wears down brakes much faster than on any other saw. I have used the Hitachi C15FB for over 10 years and have gotten excellent service from it. My one and only complaint is that is used to come with a 15" combination saw blade, part number 974651Z. The blade is no longer available for re-order, so I am told. I would like very much to see this blade resurrected and made available. I cannot and will not use carbide blades because tips have come off every blade I have used. My next purchase will be a saw that has non-carbide teeth replacement blades if this blade is not made available. I purchased this machine about 10 years ago and it has been a truly exceptional machine. While its not that easy to lug around, I often stick it in my truck to take to a job site when I need to cut larger stock than normal. It has been flawless. Best 15" Saw on the market - Period!